The Union Home Minister Rajnath Singh visited Jammu and Kashmir today to review the security situation and takes stock of the important developmental initiatives in the state. He addressed a press conference at Rajnath Singh, later on. Addressing the media at Nehru Guest House, Shri Singh congratulated the State government for successfully conducting the Urban Local Body elections in a free and fair manner without any untoward incidents of violence during polls across the state. 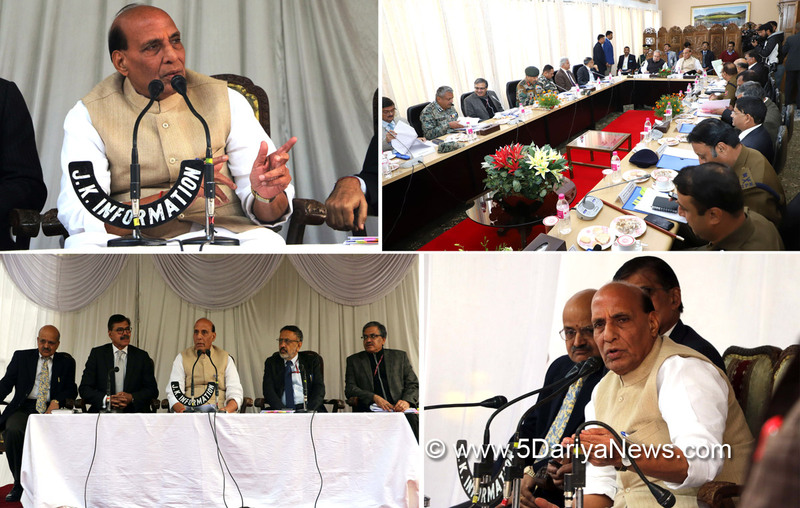 He informed the media about the discussions that were held during the day about the upcoming Panchayat elections in the state.Earlier during the day, the Union Home Minister chaired the security review meeting on the security situation in the state and also met the Governor of Jammu and Kashmir, Satyapal Malik. He also met a number of delegations across the political spectrum and appealed them to ensure maximum participation in the upcoming Panchayat elections to strengthen the grassroot democratic setup and to ensure accountability. Local bodies are also being vested with significantly enhanced devolution of powers in line with best practices in the country. This will enable them to address most of the local issues in their jurisdictions, he added. Appealing the masses to come forward, he said that the democratic way is the only solution by which we can mitigate big problems and resolve serious issues. Highlighting a major shift that has been observed in the last 4 months in view of the security scenario of the state, Shri Singh said that there has been a decrease in the number of Stone pelting incidents. Also, there is a decline in the rate of militant recruitment in the State. He talked about the special employment initiatives that are being worked upon by the central government through which 2.5 lakh youth will get employment. Union Home Minister said that presently India is recognized as world’s fastest growing economy and anti-national powers are attempting to create hurdles in order to destabilize the country. Jammu and Kashmir is yet to catch the development bandwagon. The Central and State governments are working hard towards development of Jammu, Kashmir and Ladakh regions. It is our aim to make Jammu & Kashmir a developed state, he further said.To curb the problem of rampant corruption in the state, a major initiative will be announced shortly. Terming the deaths of civilians that took place in an explosion after encounter in Kulgam, Union Home Minister, Shri Rajnath Singh expressed his regret over the loss of lives and extended his condolences towards the families of the deceased and announced a compensation of Rs 5 lakh each to the families. He appealed the civilians not to visit encounter sites shortly after the operations.Shri Singh also informed that road connectivity will be taken up for Kargil, Dras, Gurez and Keran. DPRs has been sought for the same.